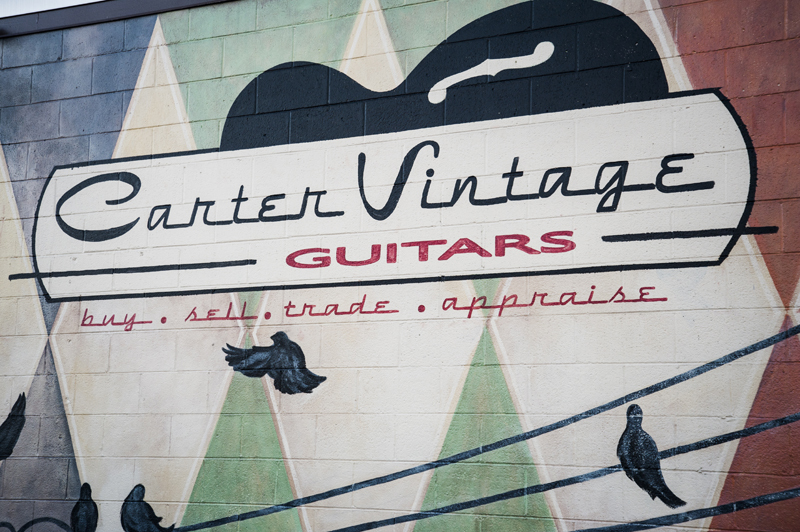 Although it has been open only since June 2013, Carter Vintage Guitars in Nashville has quickly become an essential port of call for guitarists passing through Music City. Just under a mile’s stumble south from the likeable tourist trap bars on Broadway and a mere two minutes around the corner from Jack White’s Third Man Records stands Carter Vintage. The store’s 8th Avenue location marks the western boundary of a triangular slice of neighbourhood recently rebranded as Pie Town by its artsier inhabitants in an effort to shake off a somewhat unsavoury reputation. Huge exterior murals of Maybelle Carter and a sunburst Les Paul mean that you can’t miss it, and there’s much to savour when you grasp one half of the bisected Gibson SG body that functions as a pair of door handles and step into nearly 8,000 square feet of fretted instrument heaven. Proprietors Christie and Walter Carter certainly know a thing or two about vintage guitars, mandolins and banjos. Christie worked at Gruhn Guitars for 25 years as both store manager and salesperson par excellence, while Walter’s career has included stints as a country songwriter and Gibson’s in-house historian and archivist. He also co-authored the indispensible reference title, Gruhn’s Guide To Vintage Guitars. Christie and Walter went out on their own in late 2012 and worked from their home for a short time before buying 625 8th Avenue South and renovating it in a contemporary urban style before opening their doors to the public in June 2013. Because it’s Nashville, some of that acceptance has come from celebrity clients, as evidenced by a pair of Dumble amplifiers owned by Keith Urban and a whole collection of Steve Earle’s instruments currently available in store. “Some we knew, some heard about us,” says Walter of the Carters’ famous customers. “Carlos Santana was driving by and saw Maybelle Carter on the outside wall. Other people have come from the other direction, seen a giant Gibson Les Paul and thought, ‘That must be a guitar store!’ But we knew people from previous dealings and others just heard about us. On the subject of high dollars, we wonder how the Carters feel about the state of the vintage guitar market and whether they think that its recovery from the global economic crisis of 2008 is now complete. “It was really 2009 that was the horrible year for vintage instruments,” says Walter. “Then it hit a bottom, finally, and I think it’s risen some since. It’s not back to the crazy prices of 2007 and 2008, but everything seems to have recovered now. Perhaps surprisingly, Walter also cites National resonators and 1930s Dobros as another segment of the market that is no longer buoyant: “In the case of Dobros, they used to be coveted but most people want a more modern design. And as for the steel-bodied Nationals, it’s partly that the new National company makes guitars that intonate a little better, and just in general that market is about the same as it was in the mid-nineties. 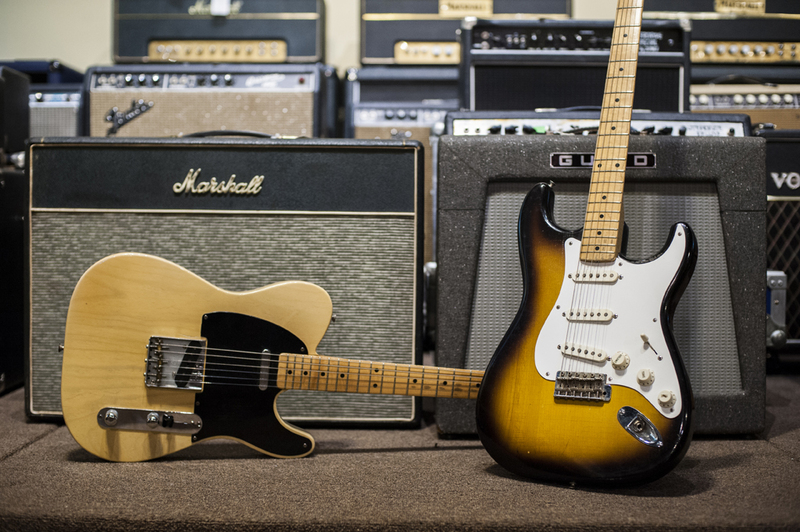 We wonder if the current climate makes it a good time for those who are looking to acquire a player’s guitar rather than invest in a collector’s piece to dip their toe into the vintage market. “It’s hard to make a blanket statement,” says Walter when we ask if there are any bargains out there. “Maybe a later version of something, if you’ve played it and it’s good. Not all of the seventies Les Pauls are bad. “If you really want a bargain, find something with a broken neck. The price should be as low as half of what it normally would be. If the neck’s been repaired properly it’s stronger than it ever was. Finally, given Carter Vintage’s close proximity to Jack White’s Third Man Records store and recording studio, we have to ask about the resurgence in catalogue brands such as Airline and Harmony in recent years, thanks in no small part to the likes of White and Dan Auerbach getting edgy garage blues fuzztones from old electrics that once might have been found in a pawnshop rather than a vintage guitar boutique.